The emergence of bacterial resistance to conventional antibiotics has been become a major issue in the health system. Currently, studies are being performed to develop new drugs that can replace conventional antibiotics. These new drugs include the antimicrobial peptides (AMPs), a heterogeneous group of molecules produced in a variety of bacterial, invertebrate, plant and animal species, which can serve as a nonspecific defense system that complements the highly specific cell-mediated immune response. AMPs have antimicrobial activities against a wide range of microorganisms, including bacteria, fungi, and viruses, and they are effective against pathogenic organisms that are resistant to common drugs. 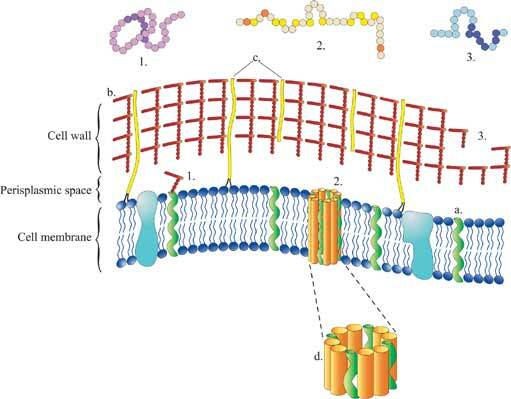 The most common mechanism of action of antibacterial peptides on microbial cells has been characterized as an alteration in the cellular membrane permeability. In contrast, there are AMPs with unusual strategies associated with cell wall and protein synthesis inhibition, nucleic acid binding or inactivation of toxins that enable microbial infection. Many pathogens can develop resistance strategies, inactivating or repelling AMPs through modification of the surface expression of pumps or secretion of proteases. In summary, this review focus on AMPs with non-conventional modes of actions and the microbial counter measures to resist these peptides. Keywords: Antimicrobial activity, Toxin, Disease control, Mechanism of action, Peptides, Unusual activity. Affiliation:S-Inova, Programa de Pós Graduação em Biotecnologia, Universidade Católica Dom Bosco, Campo Grande, MS, Brazil. Keywords:Antimicrobial activity, Toxin, Disease control, Mechanism of action, Peptides, Unusual activity. Abstract:The emergence of bacterial resistance to conventional antibiotics has been become a major issue in the health system. Currently, studies are being performed to develop new drugs that can replace conventional antibiotics. These new drugs include the antimicrobial peptides (AMPs), a heterogeneous group of molecules produced in a variety of bacterial, invertebrate, plant and animal species, which can serve as a nonspecific defense system that complements the highly specific cell-mediated immune response. AMPs have antimicrobial activities against a wide range of microorganisms, including bacteria, fungi, and viruses, and they are effective against pathogenic organisms that are resistant to common drugs. The most common mechanism of action of antibacterial peptides on microbial cells has been characterized as an alteration in the cellular membrane permeability. In contrast, there are AMPs with unusual strategies associated with cell wall and protein synthesis inhibition, nucleic acid binding or inactivation of toxins that enable microbial infection. Many pathogens can develop resistance strategies, inactivating or repelling AMPs through modification of the surface expression of pumps or secretion of proteases. In summary, this review focus on AMPs with non-conventional modes of actions and the microbial counter measures to resist these peptides.